Giardiasis is an intestinal infection of man and animals caused by a protozoan parasite Giardia intestinalis (also known as Giardia lamblia). 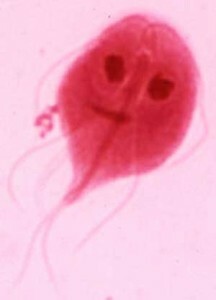 Giardia is a simple one-celled parasitic species; it is not a “worm”, bacteria or virus. The parasite occurs worldwide and is a common cause of “Traveler’s Diarrhea” in people. Outdoor enthusiasts who inadvertently consume contaminated water may develop “beaver fever”, which is another name for giardiasis in people. Other examples of protozoan parasites that can cause enteric (intestinal) disease are Coccidia, Cryptosporidia and Toxoplasma. The diarrhea may be intermittent. Most dogs do not have a fever but may be less active. The disease is not usually life threatening unless the dogs’ immune system is immature or immunocompromised. The most common drug used to kill Giardia is metronidazole, an antibiotic. It is normally given for five to seven days to treat giardiasis. Another antiparasitic drug, fenbendazole, is suggested as a potentially useful treatment, especially when used in conjunction with metronidazole. This combination is usually administered to cats with refractory diarrhea (diarrhea that hasn’t responded to treatment). Supportive treatment with other drugs may be needed as supplemental therapy if dehydration or severe diarrhea is present. Some dogs may require follow-up tests and treatments based on their condition and severity of infection.